I have recently been on the search for the perfect “healthy” muffin that I can snack on for breakfast with out feeling like I have just had birthday cake for breakfast. This is NOT that muffin. 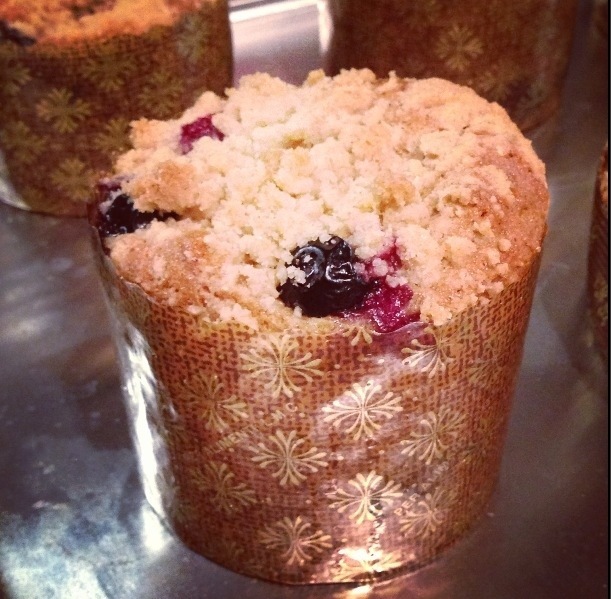 This is your classic, all the way, over the top, indulgent blueberry muffin. I think I’m starting to sound like a broken record when I say “you would never know this muffin is gluten free.” So I’m going to stop using that phrase. 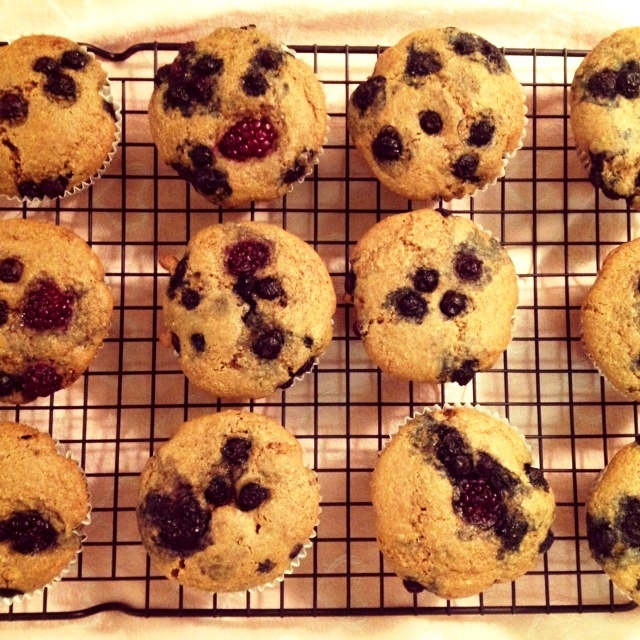 Instead, I’m just going to pronounce this an awesome blueberry muffin recipe (perfect for anyone avoiding gluten). 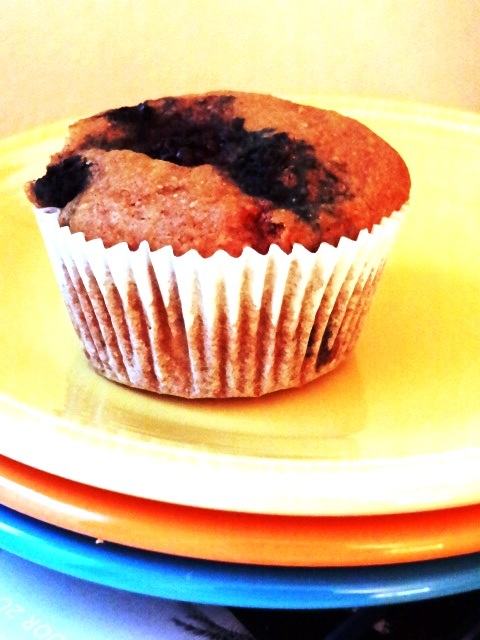 These came out moist and delicious– just as you would expect from a blueberry muffin recipe. The yogurt and lemon give these muffins a zesty flavor that keeps you wanting more. 2. Sift gluten free flour mix, salt, and baking soda together in a bowl and set aside. 3. Beat together the butter, eggs and sugar until light and creamy. Add in the lemon zest, lemon juice, vanilla and Greek Yogurt. Gently fold in the dry ingredients- being sure not to over-mix. 4. Toss your blueberries with a pinch of the flour mixture and then gently fold them into the batter. 6. In a separate bowl, use your hands to mix together your topping. This shouldn’t be too uniformly mixed, there should be clumps of butter. Place a heaping spoonful directly on top of each muffin- pressing down just a tiny bit. 7. Bake in a 350 degree oven. Large muffins take about 30 minutes, but regular sized will take about 15-20 minutes (test with a cake tester at about 15 min). The tops should be slightly golden and the topping is nice and crisp. I found the original recipe on Gluten Free Goddess ; I adjusted some ingredients so mine didn’t turn out quite like her photo…. but they did, however, taste REALLY good . They actually tasted just like a berry bran muffin. This is the first time I have used sorghum flour and I really like the consistency of the muffins. It was just like… a muffin! I am going to make more baked goods with sorghum flour from now on. Hope you Enjoy! Preheat oven to 350ºF. Line a 12-muffin pan with paper liners . In a mixing bowl whisk together the cornmeal, flours, starch and dry ingredients. Add in the oil, agave, vanilla, lemon juice,eggs, and water. Beat well to form a smooth sticky batter. If the batter seems a tad dry or stiff, add 1 to 2 tablespoons more warm water. Place mixed berries in a colander and run cool water over them. Drain. Place berries in a bowl and toss with sorghum flour. Gently fold the berries in to the batter with a spatula . Using a spoon, plop the batter into twelve muffin cups and using wet fingers smooth the tops a bit. I like to add 2 or 3 extra blueberries to the muffin tops. Bake in the center of a pre-heated oven for about 20 minutes- depending upon your oven and altitude. Cool the pan on a wire rack for five minutes then remove the muffins from the pan and cool them directly on the rack (this keeps the bottoms from getting soggy).